Not all carpet is created equal. This means a variety of equipment and specialized cleansers are required to give the best results. We use wet extraction, low moisture and dry carpet cleaning processes depending on the type of carpet and degree of soiling and staining of the fibres. 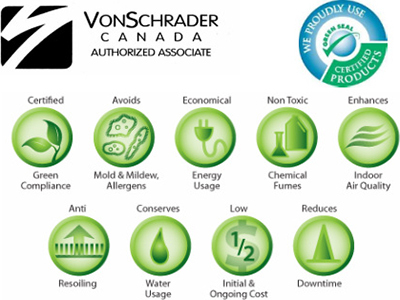 Having said this, our most used equipment and cleansers are manufactured by Von Schrader… Amazing technology from a company with more than 60 years experience with patents in the carpet and upholstery care industry. Is A Healthy Business And Environment Important To You? It sure is to us. We use Green Seal Certified and biodegradable cleaning solutions. Our Von Shrader Systems don’t require as much energy to run as other systems (like truck mounted steam cleaning units). Our Von Schrader units are self-contained. You never have to leave your front door open; your office or business temperature stays constant. We use fuel efficient vehicles, not large vans. How Fast Would You Like Your Carpets To Dry? By investing in the Von Schrader LMX system to deep clean your carpets, they will be dry faster than by any other method; usually in 1 – 2 hours depending on humidity and the thickness of your carpet. A dry foam, with only about 10% moisture is deposited at the front of the unit. Then a rotating cylindrical brush with more than 150,000 bristles agitates and lifts the carpet pile, while drawing the foam deep into the carpet, then back to the surface. Finally, a powerful built-in vacuum extracts the dirt, foam, and most of the moisture from your carpet. The result is the cleanest and driest carpet you can achieve. Wouldn’t you like to have the system used to clean the finest resorts, hotels, and casinos used to clean your home or business? Only the Von Schrader Air Cell Extraction System™ safely and thoroughly cleans carpets on-location without using damaging amounts of liquid or scrubbing action. The Von Schrader system applies dirt emulsifying cleaning bubbles (not gallons of water), brushes it all way down to the base of the carpet fiber using cylindrical brushes (unlike rotary brushes which merely clean the surface), and then floats the dirty bubbles before they can sink back down into the carpet or fiber. This simultaneous operation combined with air cell bubbles ensures that there’s no danger of shrinkage, dry-rot, browning or mildew. Plus, the carpet is dry often in less than just one hour because we control the moisture. Fast Drying and Safe for all Fabrics…even Leather! *Used by Boeing Aircraft. First, the portable, self-contained Esprit quickly dry vacuums dust and surface dirt. Then, a safe, low moisture cleaning agent is applied. Specially designed counter-rotating brushes in the hand held Power Head gently scrub and agitate the dirt and grime loose. A built-in vacuum system immediately extracts the dirt embedded foam which is collected in an easily removable recovery tank.